I grew up in a slipcover world. I never learned the finesse of the slipcover but I certainly lived with it. Way back when most of us grew up with a living room that housed a couch, a couple of end tables, the venerable coffee table and a stiff chair or two. And while recliners had been invented, they were something that never violated your childhood home. Therefore the most comfortable position to watch that medium called TV in those times was the floor. Kids can always find the best in comfort and quickly gravitate there. Yet it is that slipcover set I need to address. It seems that my slipcover education wasn't complete until yesterday when I purchased a slipcover. And while the purchase of said slipcover nearly gave me a stroke, it was that woman-with-a-big-wad-of-fabric to worn-out loveseat that completed said education. I discovered that I'm "slipcover challenged." Two decades ago this would have been termed "handicapped." A half-century ago they'd have just called me STUPID. Even with the myriad of politically correct terms, I'll just opt for "stupid" because it fits! In those years of the mid-to-late 60's life was supposed to be easy and carefree. For most families there wasn't so much cash to kick around. Thus, giving a fresh face to your living room (dens at that time were only for the rich) you didn't run out and buy new furniture. The nuts and bolts and the wooden frames of your furniture were still holding up. Mostly it was either the fabric that had dulled and perhaps there were worn parts that you didn't want company to see. The quickest and easiest fix was to cover the damned thing. That's what most folks did anyway. A wife might have pleaded to her hubby for new furniture and received back a blustering, bitter response. "There isn't a doggone thing wrong with that couch Mabel! It's as sturdy as the day we bought it." Fred just didn't want Mabel to hear that she's just scared their foreseeable budget into an early hibernation. He cringed and she had already known it, but it would allow for a slipcover upgrade. What is it they say? As for the moon and perchance you might get something? Certainly not what you are asking for but at least an offering. Therefore the slipcover age was born. The kids growing up during that era never noticed a dime's worth of difference. They flung their young bodies into chairs and couches and onto the floor—wherever they felt most comfy. Parental cries over damage those young bodies wrought fell upon deaf ears. We didn't care because we never knew the cost. But when the time did come for a freshening of décor about the domicile, dear old Mom would shop, look, search, and hope her green stamps might just cover the cost. They never did because I just recently found out that slipcovering isn't cheap. Who've thunk? Is that why what Mom dragged home to cover the old couch was so hideous? 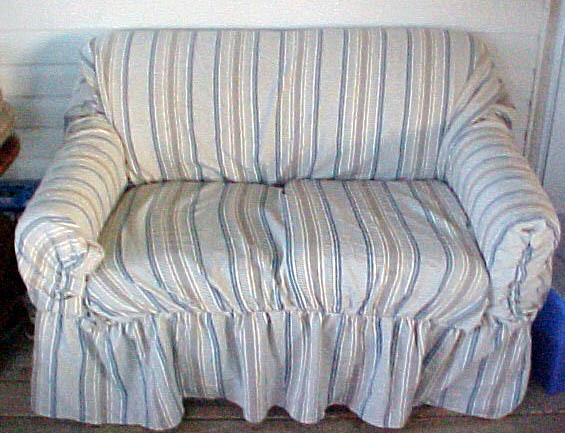 Are the makers of slipcovers in cahoots with furniture makers? I believe they must be. Everything is a glaring garish flowery display that could NEVER match the interior of anyone's home? Who would want it? Did the kids care? Did dear old Dad care? Nope! Only Mom cared and while she did her best to choose from a bad lot on sale day, I don't think she ever recovered from it. She lived in shame until the mid-70s until she put her foot down and blew the family budget and bought new furniture. Dad was still opposed to it realizing that some of us kids were still living in the household and would take all the "new" out of that furniture quickly. He was right, we did. Mom didn't care, those old slipcovers and her shame were gone for good. She'd tolerate a worn spot or two just to be shut of that red flowery stuff. I swear I think she drove her old car an extra 5-6 years just to pay the difference. Mom was way too cool!! The new furniture wasn't a recliner or even a couch. It was a "playpen" which was a newish term for an enormous L-shaped sectional with an ottoman big enough to be a bed. The doggone thing could have comfortably slept six without cramping anyone's style. Lucky for Mom and Dad, they had one of those big old living rooms with a huge picture window. You could have almost stuffed the Pentagon building in there; it seemed that big. All three of us kids and our spouses gravitated homeward just to laze about on that couch. It was nearly the most welcoming thing we'd ever known. Sit down, get sucked in, and you might be ready for Social Security before you arose again. Daddy groused and Mom just mused. That couch brought all her kids home again and kept them there. Right up until the time she didn't want us there any more. We were a hard bunch to kick out. Mom learned how! She began with subtle hints and progressed to bald statements in about two minutes flat. We kids weren't dumb, perchance a tad reluctant to leave such a warm, loving spot. It was time for us to go and we went. Very shortly afterward, Mom and Dad new we wouldn't stay away indefinitely so they up and disappeared some 1100 miles away. This time they left most of the old stuff behind. It was a NEW house and everything in it from beds to chairs to tables and couches would be brand, spanking new. It's just a damned shame they never got to enjoy it much. In less than a year both were gone. Yesterday I bought a slipcover for the very first time. It was for an aging loveseat that is doing short duty on our screened in porch before our mini-library is ready in another month. That old, stiff, and forbidding presence I wanted to lovingly transform into something that might be almost welcoming. Yesterday I shopped. I bought new lamps and shades and new pillows for the house and then I bought a slipcover. I nearly fainted when I saw the cost! Some 35-40 years later I rediscovered slipcovers. This wasn't one of those $40 "throws." I might have been better off if I had bought one of those yet all of them were heavy and ugly to a degree that only if you were desperate would you purchase them. I opted for a one-size-fits-all sort of thing. At more than twice the cost of the throw and only one that didn't have flowers, I took the plunge. After I came home and had a grand time assembling new lamps with shades and all that in my living room, it came time to address the "slipcover" and the loveseat. Can I tell you now that I hadn't a clue to what I was doing? Can I further tell you that a chimp would have been better prepared? Did I say I was, for once in my life following instructions? Say "Yea" to all of the above. After twenty minutes I knew I was in deep, deep trouble. I couldn't figure out just where I'd gone wrong. From the first I'd done what the instructions said—"find the center tag and keep it in the bottom front." I did that! After thirty minutes I discovered that there was a "front tag" and a "back tag." Guess which one I had in the front? Sigh . . . It was getting late in the day by now and the laundry on the line was calling to me to fold and put away. Dinner was nearing and had to be assembled soon. All this and I still hadn't sorted out my dilemma. That "one-size-fits-all" even when finally put on properly didn't seem to fit because my loveseat wasn't an over-stuffed version. It was about as small as you can make it and it NOT be a chair. Did I also tell you it was a sleeper loveseat? That cream fabric with medium blue pinstripes became a live thing. I would fold and stuff and gather to little avail. Then I tried it again. And again! All three cats took perches on the porch just to jostle on another in silent, feline laughter at my inadequacy. After four tries I turned to them and advised them quite frankly that "I" was the one who fed them and if they wanted any dinner this evening then they'd better hush up and dispatch themselves into the cool of the house. It didn't seem to require a second request. The birds sang and the cicadas sounded. It was down to me and that damned loveseat. I re-read the instructions for the 14th time while grinding my teeth. Suddenly it worked. Okay, so not so well, but it DID come together. By this point I was almost heading for the garage for lighter fluid—matches in hand. It was done! The next time you casually consider revamping a piece of furniture with a throw or a slipcover, just make sure you have a veteran on hand. For that piece of furniture will fight you and that ungainly mass of fabric will balk at you. They don't want to marry or bond. They just want to make your life hell. It's much easier to go into debt and pay your life away for the next three years because NO aggravation is worth this hell. Next time I'm bringing in a veteran and decamping until the violence is over. I do swear that the women of the previous two, three, or four generations and beyond were made of sterner stuff than we. Our own kids don't even KNOW what slipcovers are. It's a weird world we live in. Yet I have to concur, it's almost easier to buy new and take the bite and not be bitten by the aging furnishing you once held near and dear.